Summer normally starts by March but as early as February I together with my mom, sis and bf visited Virgin Beach Resort Cebu or simply VBR, an affordable Cebu resort in Daanbantayan. If you are still making your summer plans, check out my post about discovering VBR so you’ll be inspired to get to Daanbantayan! I have not been to the town of Daanbantayan prior to last weekend’s adventure. All I know is that the town’s pier is the jump off point for tourists heading to the attractions of Malaspascua Island. So I was curious and interested to discover the hidden gems and wonders of this sleepy town up north of Cebu mainland. If a car or private transport is not available, no worries as you can commute to Daanbantayan easily via bus. 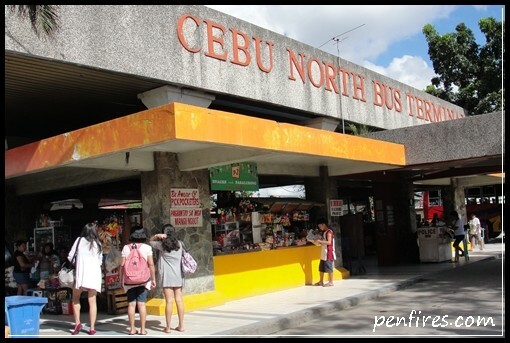 Since the town is part of North Cebu, naturally you’ll head to the Cebu North Bus Terminal :). Even if you are coming from the Mactan International Airport going to North Bus is easy pansy. For those arriving in Cebu via domestic or international flights and heading to Daanbantayan either to proceed to Malapascua or just up to the town proper, you can follow the directions on this post. You can also use this blog as reference if you are going to Bantayan and making your way to North Bus. From the airport you can ride the yellow multicab up to Marina Mall then transfer to any jeepney or multicab with “Highway” signage. Tell the driver you are getting off in Mandaue Coliseum. In Mandaue Coliseum ride another jeepney with signage “North Bus” or “Makro”. And get off in Cebu North Bus Terminal. P8 + P8 + P8 = P24 and you’ll be in the terminal. If you opted to take a taxi from the Mactan airport to Cebu North Bus insist on using the meter. You’ll probably pay around P180 to P220 for the regular taxi. Taxi rate is higher for yellow airport taxi as their flagdown rate is P70 compared to regular taxi’s flag down rate of P40. Approximate travel time if taxi is 30 minutes or so. For those coming from downtown Cebu try to find an 01K jeepney as they go direct to North Bus. North Bus is being served by various bus line companies, the famous of which is Ceres Liner. There are regular non-aircon as well as aircon buses that goes to the towns up north including Maya in Daanbantayan (gateway to Malapascua Island) and Hagnaya in San Remegio (gateway to Bantayan Island). Note though aircon buses are rarer hehehhe. Reminder: Maya and Hagnaya follows a different road, make sure you are riding the correct bus to your intended destination. Read more here for Info on Bantayan Island or Tourist Traps to Avoid in Bantayan. Travel time from the bus terminal to Maya is about 4 hours while to Hagnaya it’s about 3 hours. Travel time can be longer especially when you are unlucky and got stuck in heavy traffic within the city especially in the area of Mandaue and Consolacion. Ceres buses usually leave the terminal every 30 minutes for routes to Hagnaya and to Maya. Other bus lines also serve these routes. These three routes will get you to Daanbantayan town proper and will again diverge from there. We were heading to Malbago where Virgin Beach Resort is located so we have to take the Maya via Bagay Route. Non-aircon ordinary buses fare from Cebu City North Bus to Barangay Malbago is P140 per person, if you are going all the way to the town proper its P154. Maya via Bagay is also the route for those who want to ride the ferry to Malapascua. I don’t know how much the ordinary fare to get to the pier but probably around P170 based on its distance from the town proper. And then you’ll transfer to an outrigger boat or a ferry to go to this famous island for diving and tresher sharks spotting. As for us we chose to go all the way to the town proper for a side trip to check out the colonial stone church of Daanbantayan and to have lunch too. Hope the direction tips and guide above can help you get on your way to Daanbantayan, Cebu! If you are looking for direction to get to Cebu South Bus Terminal from the Cebu Mactan Airport, please click HERE. Please consider Sharing this post to your Facebook friends, LIKE this or share using the buttons below. Thanks much! Thanks for more instructions on the North Bus Terminal, Cille. There are lots of other companies that are dependable/reliable and I believe all are about the same fare as these are regulated by the government. I prefer Ceres also as they have plenty of buses and do not wait to fill their buses like some of the other companies. If you are a BIG foreigner (like me), be prepared to pay double fare if you choose to take up two spaces on the seat. Yup, mostly Ceres buses will stop at Hillside Bake Shop as the drivers get a free meal. Food is good and cheap, tho small portions for foreigners, hehehe. Expect to pay to use a clean C.R. But I had no change one time and left P20, so just tell them you are using my “credit” lol. Oh, by the way…ALL buses going to the North, no matter where, stop in Bogo to drop off/pick up. They use a strange routing for buses in Bogo, but since you are not driving, just enjoy the ride, hahah. Usually the stop in Bogo will give you enough time to buy some local delicacies which I’m sure Cille has told you about. Again, Penfires, great job in giving travel information. Oh, I love that colonial church in Daanbantayan, too bad more colonial churches are not still standing. Hi Ron, thanks always for adding more info for readers to refer to, truly appreciate it! And yah seats on Cebu buses are a bit smaller when compared to the buses plying long distances in Luzon. And thanks for mentioning the name of the stop over place, I forgot to asked it when our bus stopped there hehhehe. I hope to have enough time soon to feature the colonial church of Daanbantayan. I’m so glad we went there to check out the old stone church, amazing! And yah me too I hope more heritage structures will be preserved and be taken cared as they are treasures of our people and the country. Hi Lo, if you mean the bus stops establishments along the way I am not 100% sure but I think no as they mostly only serve food, snacks and drinks.